When it comes to running outdoors, you never know what Mother Nature is going to surprise you with. Ask any marathon runner and they will tell you that as much as they'd like it to be so, not every day will be 65 degrees and sunny. Especially not in our often-brutal Utah winters. Still, if you’ve got a big race coming up, the last thing you want to do is take the winter off for your training. And, as many dedicated outdoor runners can attest, treadmills aren’t comparable to running on streets or trails, even when there are a couple of inches of snow on the ground and the temperature has dropped well below freezing. Heck, sometimes those are even the conditions you’ll be facing on a race day and, knowing my hard-core runners, I could see you being prepared to push through your mileage, weather or not it’s ideal running conditions. I’m here to tell you that this is all well and good—as long as you’re properly prepared. If you go into a cold-weather run improperly dressed, however, you’ll push through the race with soaking wet shoes, socks, and feet and, more likely than not, the feeling that you’ve lost all circulation in your toes! Don’t make the mistake of assuming that the simple act of running will raise your body temperature and help you get better circulation to your feet. This is simply not the case: unless you take proper precautions, you’re likely to experience extreme pain in your toes and, if you’re really unlucky (and poorly prepared) frostbite can even start to set in! 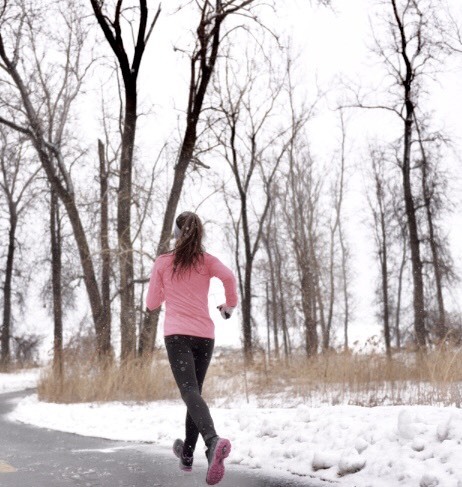 No one wants that outcome, of course, but quitting your runs in the winter doesn’t have to be your answer! There is nothing wrong with running in cold conditions but if you do, you must make sure you take the proper precautions to protect your feet. Everyone knows that shoes can make a huge impact on the health of your feet, but socks are just as important. Make sure that you have a good hardy sock, not any of those thin shear cotton socks because they don't help get rid of the moisture on your feet fast enough in wet conditions. If you are going to run a race in cold or wet conditions then consider bringing an extra pair of socks that you can put on immediately before the race begins. This will ensure that your socks are fresh and dry. Many shoe companies now make shoes that are either partially waterproof or completely waterproof. They help to keep your feet dry which will help prevent blisters from forming. The longer you stay outside in cold weather the greater chance you have of get frostbite on your toes or other areas of your body. Try to limit the time spent outside to as little as possible. If racing in cold conditions try and find a warming tent to stand in for as long as possible before your race. Always try to take the cleanest path possible on your runs even if this means going a little out of your way. Trust me it will pay off at the end of the run because when your feet, shoes or socks get wet you have a great chance of getting frostbite or blisters. Frostbite is serious business. However if you ensure that you do all you can to prepare for the cold weather, you should still have an enjoyable and successful run. Posted on 11/28/2018Should I Run Outside or on a Treadmill? Posted on 10/22/2018Why Did I Get Shin Splints? Posted on 10/21/2014Senior Health Fair--Thank You All Who Attended!